Sixteen sewers from Southville 7 Calauan, Laguna, the resettlement site of National Housing Authority co-managed by ABS-CBN Lingkod Kapamilya Foundation, Inc.-BayaNiJuan (ALKFI-BNJ), benefit from the renewal of agreement with Uniqlo’s Upcycling Project. The Upcycling Project aims to provide livelihood to the residents of Southville 7. Uniqlo collects denim fabrics from their customers who had their jeans altered and these are donated to the sewers. With the training given by Uniqlo’s takumi (sewing expert), the sewers were able to design bags from the denim scraps. The finished bags are bought by the clothing brand and will be sold in their stores as novelty items and will also be used as corporate giveaways. ALKFI and Uniqlo also renewed its partnership for the Recycling Project. Uniqlo started the initiative in 2006 where in they collect the clothes donated by their customers. These clothes, together with some of their “end of life” products, will be given to ALKFI. Through its various programs and/or projects, ALKFI will sort and distribute them throughout the Philippines. “We need the partner that shares the same passion and goals with us,” said Geraldine Sia, Uniqlo’s General Manager. 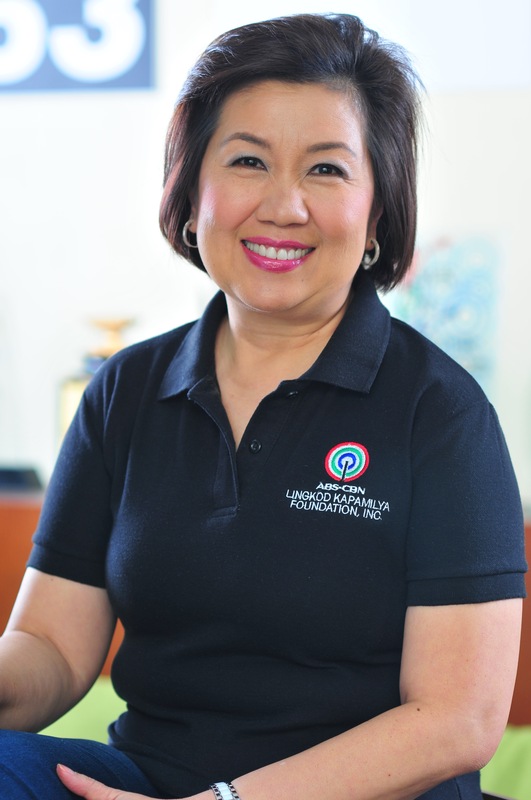 “ABS-CBN Lingkod Kapamilya Foundation is able to provide assistance in carrying out our programs as well. Through the power of clothing we were able to aid those who are in need especially the displaced communities,” she added. 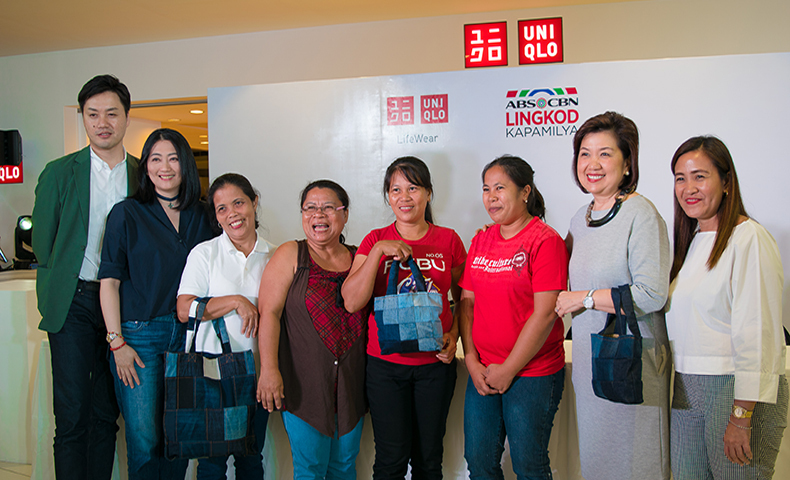 Uniqlo Heads Masayoshi Nakamura (Co-Chief Operating Officer) and Geraldine Sia (General Manager) with ALKFI heads Susan Bautista-Afan (Managing Director) and Leah Bautista (BayaNiJuan Operations Manager) together with the Samahan ng Mananahi of Calauan, Laguna, headed by Salve Estrella. Four members of Southville 7’s Samahan ng mga Mananahi check the bags they made which are displayed in a Uniqlo store. Wearing white is Salve Estrella, the president of the association. Uniqlo also had employee engagement activities with other programs and projects of the foundation. In partnership with ALKFI-Bantay Kalikasan’s Kapit Bisig Para sa Ilog Pasig, 250 families from Paco, Manila, became the recipients of its second clothing donation drive. They also donated clothes and repacked them to be distributed by Operation Sagip to families affected by calamities. Southville 7 is home to more than 5,000 families affected by Typhoon Ondoy (Ketsana), informal settling families near the Pasig River, and Home Development Mutual Fund beneficiaries. Through ALKFI’s partnership with different donors and organizations, houses and community facilities were constructed. Health care and livelihood programs were also provided. BayaNiJuan is a project under ALKFI’s Operation Sagip that co-manages the Southville 7.